At International Eyecare Center, your vision is our exclusive focus. That statement is our promise to you and the core belief driving our family of eyecare professionals. For over 35 years, we have delivered world-class vision care, comprehensive eye exams, innovative contact lens solutions, and fashionable eyewear for patients throughout Missouri, Illinois, and Iowa. IEC is a leader in eyecare, technology, and patient satisfaction. We take pride in our commitment to patients and the communities we serve. The staff and doctors at International Eyecare Center understand that every patient is different. Whether its contact lens fittings or treatment for glaucoma and other eye health issues, we provide personalized care for your unique needs. 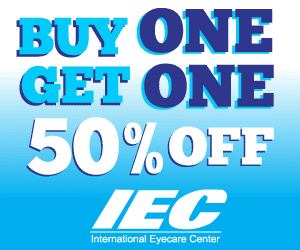 IEC makes it easy for you to save money while discovering fashionable eyewear and meeting your prescription needs. Visit us in-store or reach out via phone or email for more information about these great offers for designer eyeglasses.